No one goes to Friendly’s anymore. Honestly, I don’t know how they stay in business. But still, you see the restaurants all over the place, parking lots empty except for a few battered Fords and some wind-blown litter, slatternly waitresses hanging out by the back door smoking cigarettes, a few families ducking in for their Fribble fix. So they tinker with the menu, in the hope of finding some magical new combination that will bring the franchise back to relevancy. Witness: The Soft Pretzel Bacon Burger. That’s right, they’ve done away with the bun and replaced it with . . . a very soft, pillowy even, pretzel. As it turns out, I immortalized Friendly’s in Bystander. Go ahead, turn to page 44. Eric is out with his mother and younger brother, Rudy. They are eating lunch at Friendly’s. “How come the pictures on the menu look so much better than the real food?” Rudy wondered. 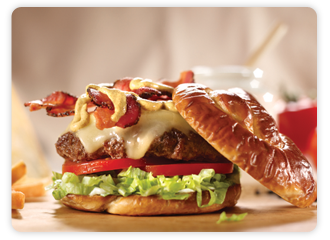 Of course, I wrote that scene before the innovation of the new Soft Pretzel Bacon Burger. Or else it would have been an entirely different book. Sort of like, I don’t know, imagine The Phantom Tollbooth in the age of cell phones. Different, right? JP, I think my daughter keeps Friendly’s in business. She and I would go there when she was little and she LOVED getting a “cone head.” She, now age 27, will still stop at every one she sees, just to get a cone head. Go figure! That burger does seem wrong. Though I would get that minus the bacon over KFC new Double Down Chicken Sandwich, where the chicken is the bun. Did a quick search for the name of the new KFC sandwich, and learned its about 1,228 calories. Great to hear from you, Doret. A pretzel is the bun, chicken is the bun. I’ve got an idea! I’m going to open up a new place and . . . the bun will be . . . an actual . . . bun. I’m Old School that way. And yes, there will be pay phones in the lobby. You say no – one – goes – there…..well I have been known to eat a Fishamajig when CB is not looking. I am always told that it is fair trade, free range, grass fed fish…..so I feel good.